Microsoft Edge, the replacement for Internet Explorer browser in Windows 10, is relatively new compared to popular third-party browsers like Mozilla Firefox, Google Chrome and Opera. Because of this reason, the new web browser from Microsoft lacks several features and options. Microsoft has been adding new features and settings to Edge with each major update to Windows 10. The browser has recently got support for extensions, and Microsoft has also announced at BUILD event that the Edge will get better web app support when Windows 10 anniversary update is released later this year. While Microsoft has been doing a great job with Edge, the built-in browser lacks many basic settings and options. For instance, the Edge browser is still missing a browser reset option, meaning you can’t easily reset the Edge browser. If a malware or potentially unwanted program changed Microsoft Edge’s default settings, there is no easy way to restore Edge settings to their defaults. While you can manually reset/reinstall the Edge browser, not all users prefer going through the tedious procedure. Those of you who have been using Edge as your primary browser can now easily reset Microsoft Edge settings their default by downloading a small tool called Edge Reset Button. 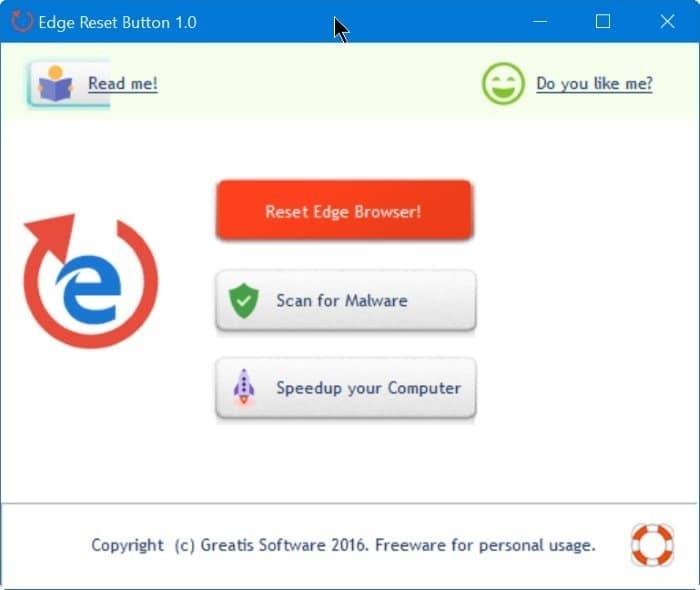 Edge Reset Button a small free for personal use utility designed to help users restore original Edge browser settings in a jiffy. The initial version of Edge Reset Button resets the home page of the Edge browser only, and you can’t use the tool reset other settings of the browser! All in all, a fairly useful tool to reset the home page of the Edge browser. 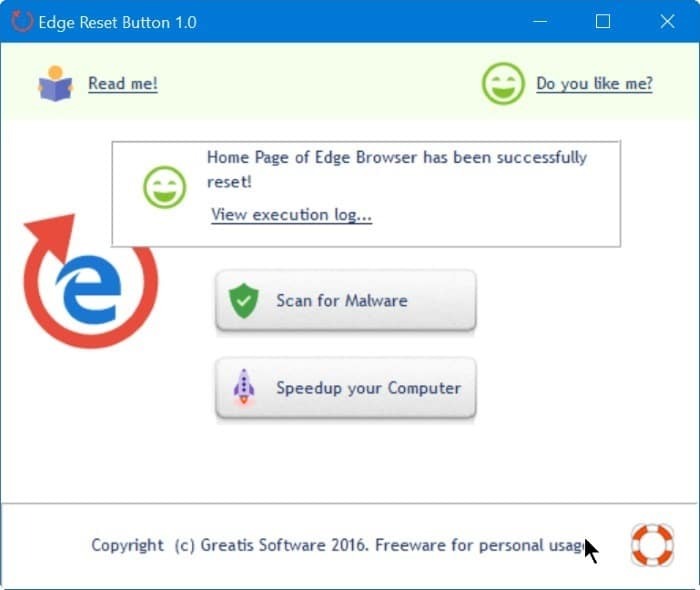 The tool comes in handy only when a malware or potentially unwanted program has hijacked Edge browser homepage and you’re unable to reset the homepage using the standard method. An option to reset all settings of Edge browser would have made this tool very handy for all Windows 10 users. If you’re having serious issues with Edge, please refer to our how to reinstall Edge browser in Windows 10 guide to resolve all issues. Viney Dhiman, I can see how worried you are using third party tools, but the bread is not yet baked enough. Plants have not been watered. Sun is always up the sky. Fishes swim and they get wet, sometimes they drown. I wish Microsoft include the reset button in Edge for Windows 10, because I don’t want to depend on third party tool. Nice article, but I will wait for the update in which software giant introduce this reset button.